When looking to replace your windows and doors, it is important to consider the type of glazing alongside the window’s U-value. A U-value measures how well heat is transferred from your window in or out of the building. The lower the U-value the better the heat conservation. Often a requirement in listed buildings, single glazing is where the window or door is glazed with a single layer of glass. All original windows and doors in period properties would have had single glazing. However, most people now view having single glazed windows as a disadvantage due to the high level of heat loss. Double glazed timber sash windows manufactured and installed by The Sash Window Workshop. 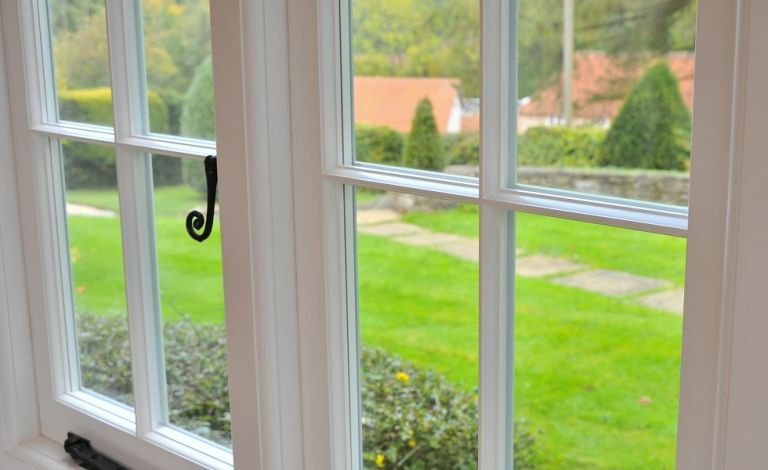 Double glazing has been widely used for timber windows and doors for over 40 years. A double glazed unit comprises of two sheets of glass separated by an air gap. The air gap helps reduce the heat conduction between the panes. This allows heat to be retained in the winter and to keep your home cooler during the hotter summer months. To further improve thermal efficiency, gases, such as Argon, xenon or krypton, is often pumped into the airspace between the two glass panes. While an average single glazed window will have a U-value of 4.8 this drops drastically with the installation of double glazing, with a typical double glazed window having a U-value of around 2.3. Triple glazing operates in the same way as double glazing but with an extra pane of glass. It is worth noting that triple glazed windows often do not fit in period properties due to the thickness of the windows. Casement window secondary glazing manufactured and installed by The Sash Window Workshop. Not to be confused with double glazing, secondary glazing is where a separate window is installed internally to improve thermal efficiency and reduce noise. This is popular in listed buildings where double glazing or triple glazing is unlikely to be approved. Secondary glazing provides all the thermal and noise reducing benefit of double glazing while retaining the existing windows. However, it is worth noting that you will have to open two windows anytime you wish to circulate fresh air into the room. Bi-fold door with safety glass manufactured and installed by The Sash Window Workshop. Acoustic glass is designed to reduce noise coming into the property through the glass. Safety glass is designed to shatter into small pieces when it is hit hard, reducing the chance of injury. This is a legal requirement in glass below a certain height from the floor level. Obscure Glass, also known as Opaque, is any textured glass and is often used for increased privacy or decorative effects. Examples of obscure glass include frosted or etched glass. Sash windows with obscure glass manufactured and installed by The Sash Window Workshop. When replacing your windows or doors, speak to the companies you are obtaining quotes from about the different glass options. A specialist window and door company should be able to advise you of the best glass to meet your needs.